It was striking to realize that neither JT043 nor JT610 crews were able to quickly identify the stabilizer trim commands as a runaway. This stands in stark contrast to the expectations of the hazard assessment, that the crew would take the right action. The FAA Airworthiness Directive highlighted both the issues relating to erroneous Angle of Attack (AOA) and how MCAS malfunction should be responded by stabilizer trim cutout. Is it possible that ET302 flight crew were not able to recognize this exact situation, and would not be hypersensitive to stabilizer runaway? If this is the case, then human factors are completely out of bed with assumptions. 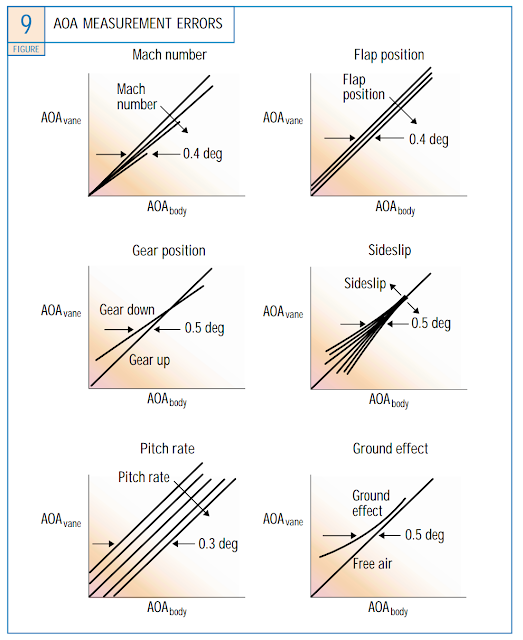 A single erroneous AoA vane causes a large number of flight deck effects that may have been underestimated in its consequence on pilot workload. Stick Shaker goes off on one side as soon as the airplane is airborne. Pilots are trained to react to stick shaker by applying approach to stall recovery techniques. This involves cross-checking. What could cause the airplane to stall unexpectedly at liftoff? Perhaps flaps retracted or spoiler deployed? Were the V speeds calculated incorrectly? Airspeed and Altitude Disagree lights up, due to the erroneous AoA feeding the wrong static pressure compensation. The difference is modest, but comparison must be made across three dials to make any judgement. Not being sure your airspeed while stick shaker is going off is unnerving. Minspeed Tape blooms up to current speed, affected side only. On top of everything else, the pilot sees the airspeed is at the minspeed due to AoA above Alpha "max". This makes the pilot want to speed up the airplane, but the erroneous data will not give him any relief, it chases him. 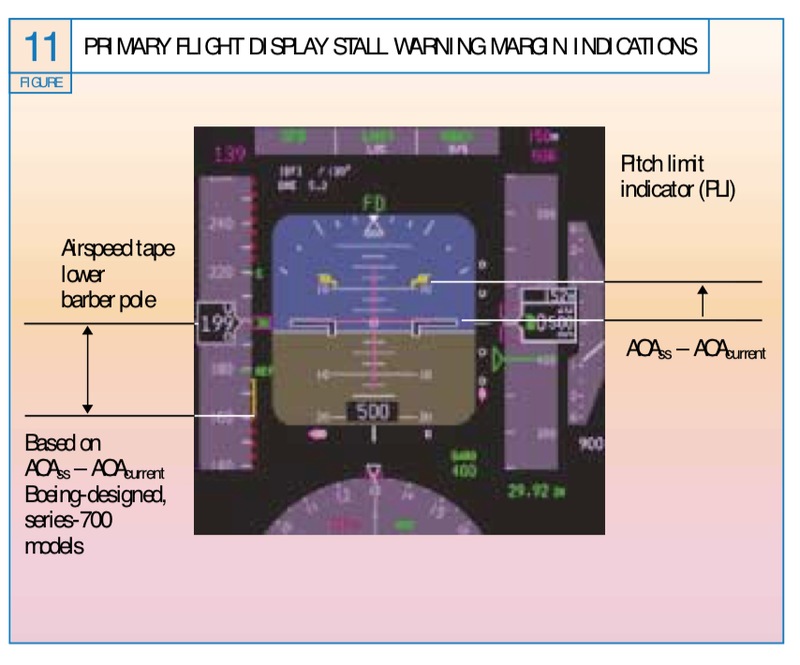 If the option were selected, the pitch limit indicator (PLI) would show that the pilot attitude is at the maximum and would encourage him to lower the nose. Again, with the erroneous data, the PLI would chase him down. Elevator Feel Shift Module (EFSM) is set, making it much harder to pull back on the yoke than normal, encouraging the pilot to move the yoke forward. Speed Trim System (STS) is active in manual flight. STS applies stabilizer trim as a function of airspeed. As you slow down, STS trims stabilizer Airplane Nose Down (AND). As you speed up, STS trims Airplane Nose Up (ANU). 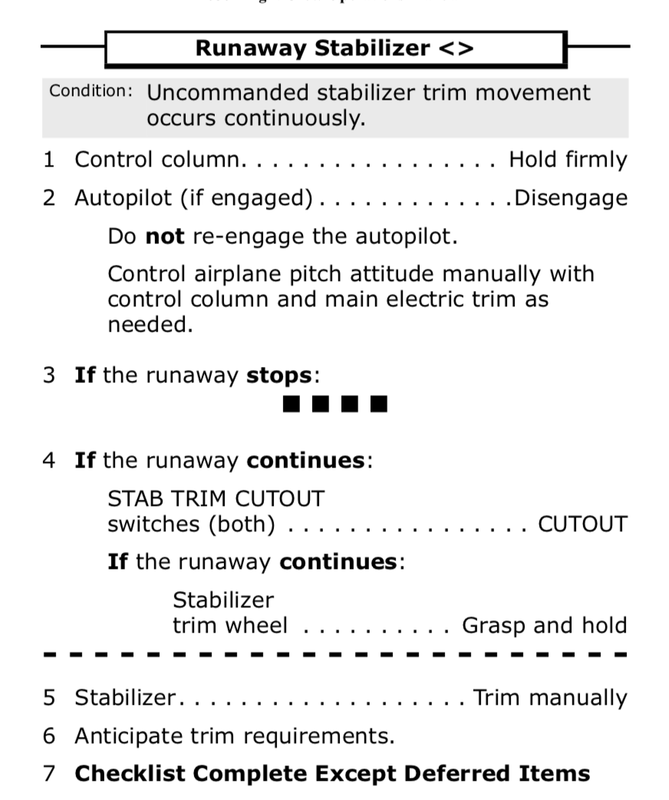 Pilots are accustomed to the STS applying stabilizer trim commands; the automatic motion of the trim is a normal event. MCAS trim commands are applied over a ten second period and then stops. It appears the amount in each step is a function of airspeed, with lower speeds taking 2.5 deg AND and higher speeds taking 0.6 deg. AND. 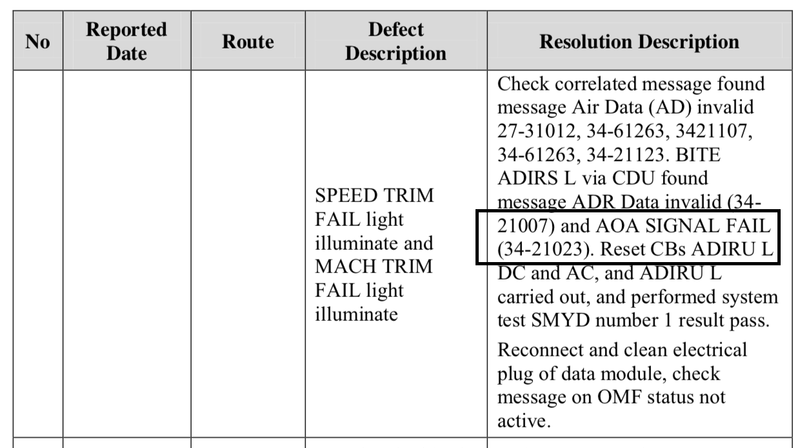 It appears that if the pilot applies any electric trim through their yoke switches, MCAS will stop any trim command and apparently reset it's logic for the next command after five seconds. Thus every time the pilot trims ANU to offset MCAS AND, MCAS is re-enabled after five seconds, and with the AoA erroneous reading a constant, is triggered again and again. That will be fixed by a software change. 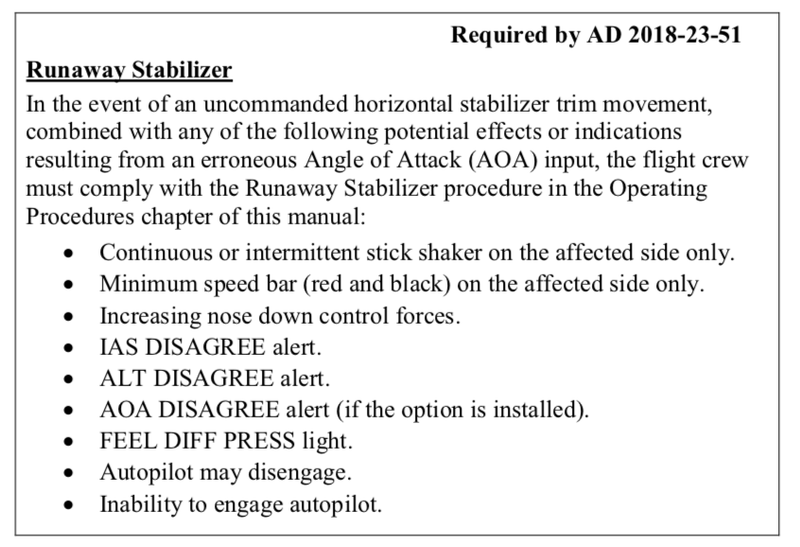 The expectation is that the pilot would notice the erroneous stabilizer commands, treat them as a runaway, and use the cutout switches in response. If MCAS applied a continuous AND trim command, while noting that a runaway has always been as continuous motion, the flight crew would be more likely to recognize it. Instead, the MCAS trim command would stop and "hide" from the pilots. Thus the assumption was flawed, in the context of STS motion as cover, and that the MCAS "uncommanded" motion was not continuous. The FAA AD should have solved that awareness issue. The loss of JT610 would be a glaring motivation for any 737 MAX crew to study and prepare for. Perhaps underappreciated is that the AoA erroneous output was a much bigger impact than expected? This is the hallmark question about ET302. Was reading the AD enough to prepare for the situation, or should they have had a chance to experience it first in a simulator? The AoA failure would seemingly be an option in any 737NG simulator; the response is the same as in the MAX. It just would not have the MCAS aspect. I was responsible for the Thrust Management System Crew Training Simulator Data Document and the Checkout Data. The document provides the "control laws" for the simulator programmers to reference. We ran certain flight conditions and recorded responses. The simulator manufacturers had to run the same conditions and match their response to ours. The Data Document was hundreds of pages of detailed flow charts. From what I gather, MCAS control laws are pretty straightforward. The level of effort to produce them for the simulator manufacturers, for them to code them up, and for the checkout data to match up is not substantial, and certainly could be completed in a limited manner within a few weeks. I cannot speak for Boeing or for any simulator manufacturer, so take my thoughts in context. But we are not talking rocket science, this is a routine task. The AoA gauge has sprung into the spotlight along with the AoA Disagree alert. While there are many interesting uses of the AoA gauge, AoA itself has many limitations, which is why its use is actually quite limited overall. 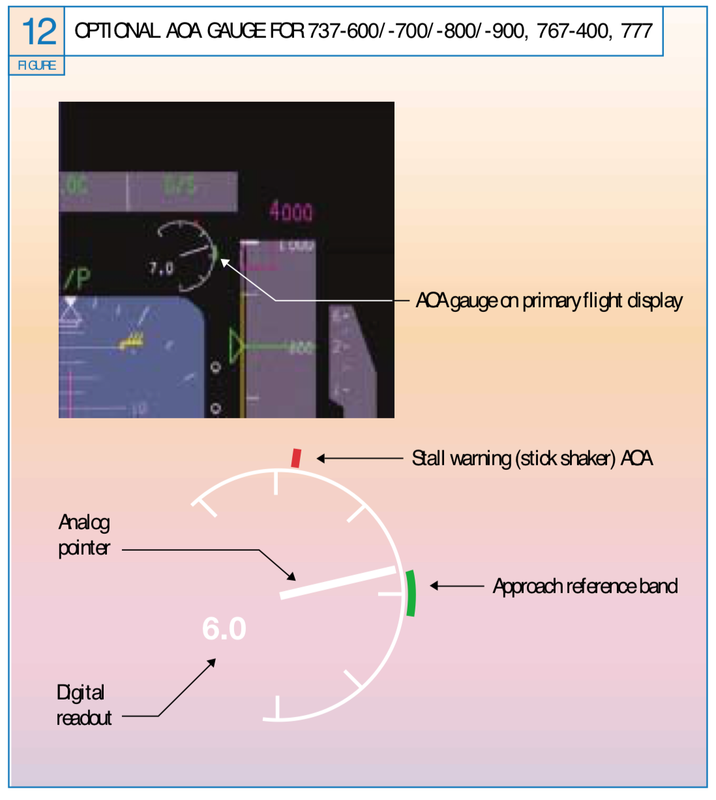 The following figures are excerpts from this excellent Boeing article on AoA gauge. Boeing encodes AoA into the minimum speed calculation and into the PLI. The gap from current airspeed to minspeed, or from current pitch attitude to PLI represent margin to Alpha "SS" (Stick Shaker). The AoA gauge shows this amount directly. The challenge with any instrument is training the pilot to use it properly. Boeing basic design without an AoA gauge offers a singular approach to assessing Alpha Margin. Adding the AoA gauge offers a second means to accomplish that, which drives up training requirements. More information is not necessarily better or safer. In fact, flight deck design specifically tries to only show the minimum information a pilot needs to take the right action. For these reasons, I believe Boeing flight crew operations did not make the AoA gauge basic. However, customer requests were sufficient for them to relent and offer it as an option, which I think is unchanged going forward. AoA Disagree is another issue entirely. This alert was originally provided just as a flag to disregard the AoA gauge if the AoA differed significantly from Captain side to F/O side. With only two vanes, a disagree does not tell you which is right, so the best approach is to ignore it entirely. MCAS was originally designed to use one AoA vane. A fail-safe feature to inhibit MCAS with AoA Disagree is apparently to be added by a software update shortly. In the case of the AoA gauge option selected, AoA Disagree was designed to tell the pilot to ignore the gauge. However, it serves another purpose so useful Boeing will make this basic even without the AoA gauge selected. 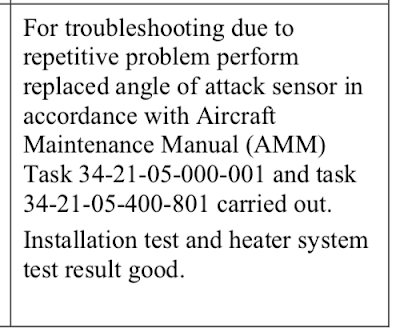 The AoA Disagree Alert will be recorded by the pilot in the maintenance log, ensuring that the AoA vanes will be serviced. 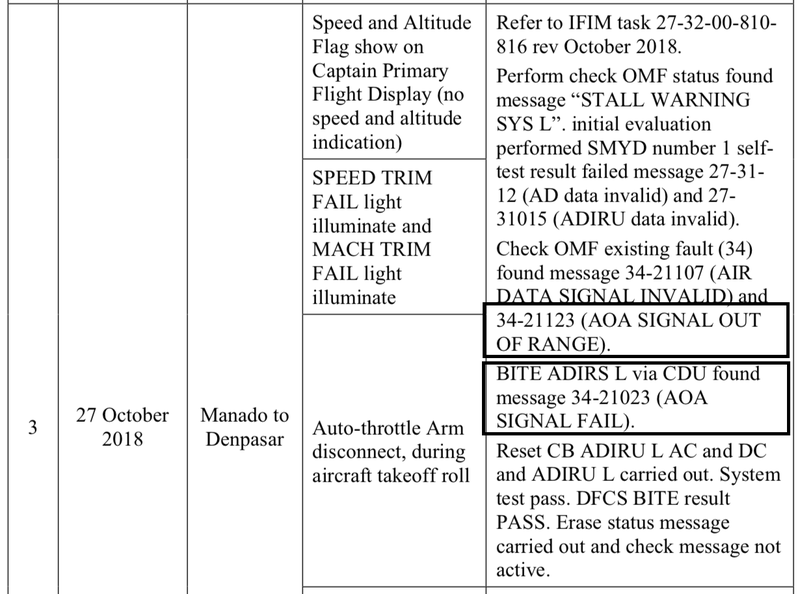 This was the critical failing in JT043 - they made no entry that there was an AoA vane issue. Unlike the failures in prior flights, the AoA vane bias was within expected values, and was not detected as failed. The benefit of AoA Disagree in the JT043 or JT610 scenario is not entirely clear. Strictly speaking, one stick shaker on and the other off is a pretty big alert itself. But assuming something is never as good as knowing something. Seeing AoA Disagree with one stick shaker going off and the minspeed tape running up should give some help to the flight crew to disregard the stall warning. That could lower workload and offer more capacity for the flight crew to deal with MCAS, even if they don't make the direct association. Prior to JT043, the AoA on the Captain (left) side had issues and was replaced. First, AOA signal fail was fixed by reset of the ADIRU. ADIRU is a combination of the Air Data Computer and the Inertial Reference Unit. On the next flight, AOA signal out of range is displayed and again ADIRU is saying AOA Signal Fail. What is interesting is the entry that says Stall Management Yaw Damper (SYMD) failed because of ADIRU data invalid. If the only ADIRU data that was failed, does that mean the SMYD gets AOA from the ADIRU? SMYD provides the stick shaker command, the EFSM command, and the minspeed and PLI commands. 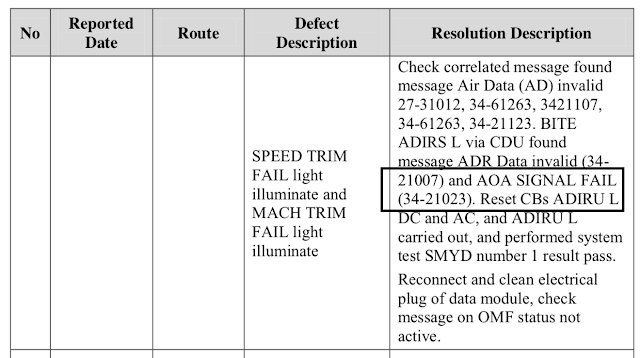 From the information we have, SMYD is using erroneous AOA data on JT043 and JT610. On the 737NG, SMYD is a dual channel system that includes an analog resolver AoA input. I can find no entry for the SMYD in the 737 MAX Master Minimum Equipment List (MMEL). It is provided clearly in the prior 737 (NG) MMEL. This, in combination with the above, leads me to wonder if the SMYD is still an LRU on the 737 MAX, or did it get absorbed as a function into another LRU? TAKE THE FOLLOWING AS UNCERTAIN. If I were to guess, which is what this is absolutely, I would host SMYD in the Flight Control Computer (FCC) or autopilot. The FCC has nearly everything needed for SMYD functions already as far as software architecture, design assurance level, and hardware interfaces. It may not have an analog resolver interface for AOA and could use the ADIRU digital data bus (ARINC 429) instead. I HAVE NOTHING TO CONFIRM THIS. My point is that maybe in all that change to MAX a new problem has snuck in, that would not be on any prior 737. The AoA vane was replaced prior to JT043. Surely the Indonesian investigators have had a chance to examine it. Did they find any fault? Why was the vane installed prior to JT043 in error? The maintenance test for replacing a vane would normally require a calibration check, where the vane is put into certain positions and the vane angle is confirmed to be correct. The issues encountered in ET302 AoA vane must be taken into account with these two vanes apparently on Lion Air that malfunctioned. Is it a problem with the vanes or is it a problem in the data processing? What needs to be fixed? Was this just a string of bad luck and coincidence? 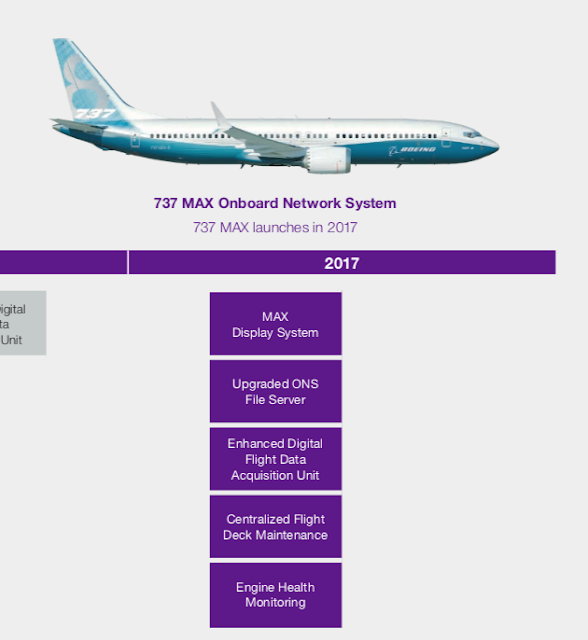 Boeing provides an Onboard Network Server (ONS) to record and report flight system parameters and faults. This information is the foundation for Airplane Health Monitoring (AHM). ONS surely records AoA vane angles as a feature offering a data warehouse to look back through prior flights for any issues. 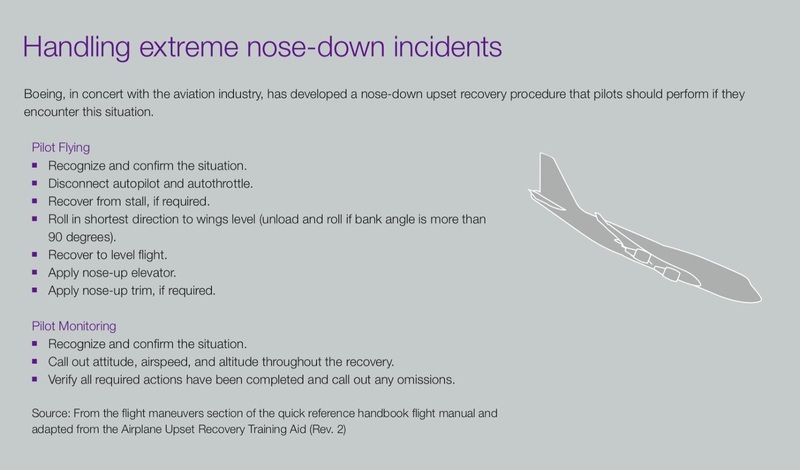 In the same issue, there is a slide on handling an extreme nose-down incident. I remain steadfast in noting that a flight crew entering a nose dive does not reliably trim ANU. They will reliably pull the yoke back. The whole point of the aft-column-cutout switch prevents continued AND trim in a dive, due to a runaway stabilizer. Therefore any AND malfunction that does not stop by aft-column-cutout must be shown to be extremely improbable. My opinion, and I tend to shoot for perfection. Finally, on the issue of handling qualities. From what I gather, the new engine/airframe combination known as 737 MAX suffers a pitch up in an accelerated stall due to the interactions between the engine cowling and the airfoil, effectively moving the center of lift forward. MCAS applies a stabilizer AND trim command to offset the pitch up tendency. This aspect is essential in ensuring the pilot does not have to push the yoke to stop the plane from pitching up, which violates positive stick force per g as required in 25.255. There are other aspects of 25.255 regarding the performance of the elevator and the stabilizer. JT610 dove quite steeply. 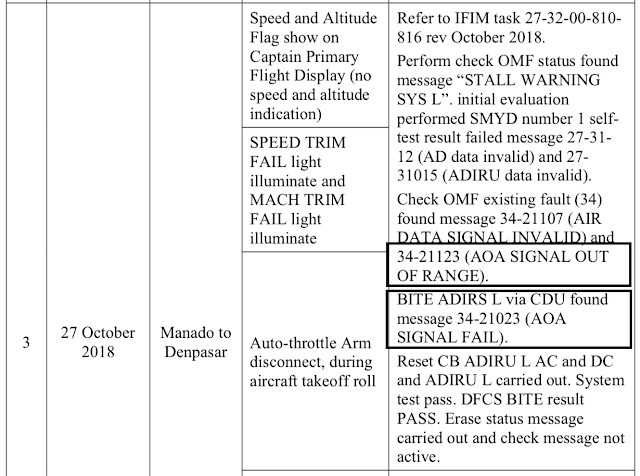 Any aspect of the elevator, in particular, failing to provide commanded travel would be noted in the JT610 flight data. The final report for JT610 should identify any shortcoming in the flight control system to perform during the dive. To assure a safe and expeditious recovery from an unintentional stall, it should not require any unusual piloting technique to successfully demonstrate compliance with § 25.203, nor should it require exceptional skill or repeated practice by the test pilot. The behavior of the airplane during the stall and recovery must be easily controllable using normally expected pilot reactions. The airplane should be trimmed for hands-off flight at a speed 13 percent to 30 percent above the reference stall speed, with the appropriate power or thrust setting and configuration. Then, using only the primary longitudinal control, establish and maintain a deceleration (stall entry rate) consistent with that specified in § 25.201(c)(1) or (c)(2), as appropriate, until the airplane is stalled. Both power/thrust and pilot selectable trim should remain constant throughout the stall and recovery (to where the angle-of-attack has decreased to the point of no stall warning). During the approach to the stall, the longitudinal control pull force should increase continuously as speed is reduced from the trimmed speed to the onset of stall warning. Below that speed some reduction in longitudinal control force is acceptable, provided it is not sudden or excessive. Trim at 1.3 VSR. Once trimmed, accelerate to a speed that will allow enough time to set up and complete the maneuver at the specified load factor and airspeed deceleration rate. Set power or thrust appropriate to the power or thrust for level flight at 1.3 VSR and do not adjust it during the maneuver. In a level flight maneuver, 1.5 g equates to a bank angle of 48°. To prevent an excessive deceleration rate (e.g., greater than 3 knots per second), a descent may be used. Conversely, if the deceleration rate is too low, the maneuver should be conducted in a climbing turn. One pertinent Regulation: § 25.203 Stall characteristics. I find the AoA document strange! It spends 70% of the text to argue why one can't use AoA for anything useful because of N factors (most of non relevant for how you fly on AoA) then it finishes with why the Boeing AoA indication you CAN buy compensates for all these N factors and is quite useful. Strange indeed. EVERY PFD info shown is corrected in a number of ways, many with AoA. But AoA cannot be corrected even though it's an important corrector or other data???? This document has but ONE purpose, to explain why Boeing didn't introduce AoA as standard a long time ago. We use speed as a proxy for AoA today for transport aircraft. The artile has the attitude as we can't find ONE AoA value for takepff or landing it's no good. Yet we calculate V1 Vr V2 and Vref for every takeoff and landing with aircraft config, weight, altitude and temp as inputs. Just one example of the texts wierd attitude. AoA would vary with weight which is not good according to the article. Of course it does! This is the point. If we takeoff or land with a heavy aircraft we are closer to max AoA, ie we have smaller margins! Then; Max AoA changes with slat. Of course it does. This is the purpose of a slat, to increase AoA max before stall. So you can't learn two max AoA values but zig memory speeds and speed paddings are ok? So if you fly a landing on AoA you can have a tailstrike because you can't use any other after the threshold to check you pitch angle? If we flyu AoA it's the only value the Pilot shall use? ?But with speed you calculate Vref for every landing and you flare with differnt speeds depedent on landing weight etc. Another tack is we can't introduce AoA because it triggers additional traning costs. Of course it does, we give the Pilot new and better information. In consequence we can't introduce new and better cockpits as this trigger additional training costs? We have the MCAS situation because of this wierd attitude. The baen counters buy aircraft for $50 to $200m a piece but we can't give the pilot better and more direct information because there is a onetime cost in learning him to use it. Air safety is not allowed to cost a cent extra. I can go on and also show the cruise discussion is wrong but it requires more explanation. As said this article as but one purpose. Just working off memory, but we have an alpha target for each flap setting. It is weight independent. The Vmin speed equates to 1.23 Vs1g, which of course is a different speed for every gross weight. It can be compensated for CG and even for spoilers. The speed tape tries to normalize the situation. Early airplanes, like 757/767 had to calculate minimum speed solely by reference to alpha margin converted to speed margin. The use of FMS gross weight is another approach, but leaves open the issue of entering the wrong weight, which has resulted in incorrect takeoff calculations but can be corrected for approach speeds by alpha margin. We don't have a good solution for takeoff speed error by entered gross weight. The best you can do is look at inertial acceleration. I can tell you are passionate about the AoA gauge. I see the utility. But what problem are we solving? I grew up in the gee-whiz era. We just added features because we could. That quickly changed to return-on-investment. Pilot wishes and desires had to have a business case. This certainly stopped feature creep. I wonder where will all the bells and whistles lead us? Have we gone to far with gizmos? Automation is becoming band-aid on top of band-aid, catering to every corner condition. I'm not passionate about AoA. I'm an aerodynamicist and worked in aircraft design. We fly on AoA for the low-speed regime, not speed. High speed we need to take Mach effects in account. We only use speed because it was easier to measure and present until the 1970s. We, therefore, also live with all its inherent limitations. It's less informative, less exact and as you point out more error-prone (as we have to correct for weight all the time, among other things). I don't buy the gizmo discussion. We are loading the cockpits with more information every decade (TCAS, TAWS, CPDLC/FANS, HUDs...) because it's useful information which makes the flight safer. Yet we can't add AoA? Instead, we layer one thing after another on our inadequate proxy for AoA, speed, to convey what AoA would have done better. Barber poles, amber regions, pitch eyebrows. So it's fine adding 3,4,5, .... other pieces of information because speed is a bad proxy for AoA, but not the value which would have done the job to start with?. How can AoA be a Gizmo, when it was the value we should been displayed in the first place? This I can't understand. A poor choice of words on my part, passionate in the sense that with your deep background you can appreciate the AoA gauge more than most. I agree we are loading up the flight deck with more and more information. TCAS and TAWS bring traffic and terrain into focus (plus ADS-B IN). CPDLC/FANS (which is 24 years old now) moves from voice to data link, allowing better routing and lower workload due to HF voice challenges. HUD offers the pilot better situational awareness in a visual procedure, especially low visibility takeoff. Under normal circumstances, these all have operational or safety benefits, but in each case the pilot has another complex system to manage. This is clearly a tradeoff, and there is a worry of too much. The AoA gauge and the minspeed plus PLI both are trying to solve the same problem. Alert the pilot to their margin from stick shaker. If the approach speed is selected too slow, the alpha will be too high, and the minspeed will intrude onto the selected target speed. The pilot flies airspeed, not alpha. By reference to minspeed, there is no mental translation. If flying Alpha, the pilot has to make the judgement to translate the excessive AoA into a speed change. It certainly can work. And many pilots will have no issue with that. But this means the pilot will have to expand their scan to look not just at airspeed, attitude, heading, altitude-vertical speed, to include AoA. How often should AoA be scanned? Is there a body of evidence to show how AoA gauge reveals something not seen in the Minspeed/PLI presentation? Does adding AoA gauge change the pilot performance? There is no doubt that the customer community outcry for an AoA gauge was compelling, because Boeing offers it as an option. They leave it this way because their flight deck philosophy concludes that it complicates the human interface without demonstrable benefit and is possibly detrimental (in their eyes). When you refer to AOA, are you using raw AOA or normalized (%) AOA? Most transport aircraft exhibit .6 AOA for approach speed, .45 AOA for maximum endurance and .28 AOA for best range speed. Just curious. AoA in degrees from the sensor. I would add that that it remains unclear if the Rosemount Model 0861 AOA Transmitter, which consists of the sensing vane and shaft encoder, was the source of the biased AoA values. Was the specific type of AoA Transmitter on 610 and 302 one that produced digital values used directly by the ADIRU and other components, or was the Transmitter one of the types (e.g., resolver outputs) that produced analog signals digitized by a second AoA related component between the Transmitter and ADIRU, such as the Model 0020 Electronic Signal Conditioning Module. If the MAX uses AoAs with analog outputs and a second box to digitize the analog outputs, that might explain why changing only the Transmitter did not correct the problem on 43 & 610. Can I ask your clarification on an issue? You said: "From what I gather, the new engine/airframe combination known as 737 MAX suffers a pitch up in an accelerated stall due to the interactions between the engine cowling and the airfoil, effectively moving the center of lift forward." Do you mean, literally, that at stall the aircraft will continue to pitch up rather than recover? Without any augmentation, yes, under a certain condition, the airplane pitches up all by itself. The Pilot would have to push the yoke to stop it from doing that, which is where the violation with Stick Force per g comes into play. The MCAS stab trim increment offsets the pitch up, with pitch down trim command. The 757 and 767 ran into that problem too, but in that case it was the wing downwash coming into play on the horizontal stabilizer. Pitch Augmentation Control System (PACS) was designed to add a small increment of stabilizer to offset the pitch up. In flight test, vortex generators were found to be adequate, by virtue of favoring the wing tip Versus wing root, the center of lift moves outboard and necessarily aft, providing a pitch down effect. PACS was removed. The aero engineers on the Boeing airplanes are the best of the breed and would have certainly considered aero band-aids as an alternative to MCAS like we did on 757/767. A vortex generator is a lot cheaper than a fail-safe dual channel control system. Although, for 737 MAX it was a software feature, not additional hardware, so that is a much lower barrier. "The aero engineers on the Boeing airplanes are the best of the breed .."
The things that come up and receive sufficient public coverage (787 battery, 737 MAX engine integration ) are not really errors made they appear "thoughtless" for lack of a better word. So where does the quality step down come into play? Is it the task ( bend the words to allow certification ) set that is "defective" ? My comment was about aerodynamicists. 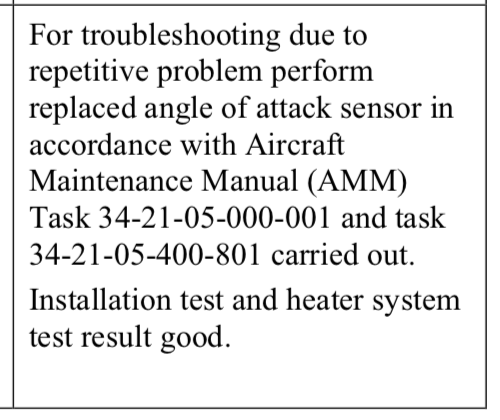 As for system engineers, for MCAS, there has been a significant shortfall in failing to account for a basic fault (misleading AoA vane angle) in enabling retrigger, and for not providing a Fail-Safe response. These aspects show a complete lack in skill and oversight, really an abomination, and must be addressed. Hiding MCAS was driven by fears relating to common type rating. Thank you for that. Most of the explanations for MCAS that I have come across have stated that it is only there to correct a reducing rearward stick force as AoA increases which would be counter to FARs. Would you humour me with a step further? If, in the absence of MCAS or with pitch trim turned off, the aircraft did enter a stall would it recover naturally? Take a look at the end of the article, I have added a new discussion and references to answer your question. There is no requirement for a hands off recovery. You cannot have a pitch up, and you have to maintain positive stick force per g.
What I understood is that the AoA is connected to the ADIRU and that STS and MCAS is implemented in both FCC's. In the case of JT610 ADRIU-1 gave incorrect values which triggered MCAS-1. The captain got incorrect values and continuous stick shaker. I think now that when the controls where handed over to the F/O things got worse because when the captain stopped trimming MCAS-1 was not interupted anymore, even by trimming by the F/O. That got them into the dive and where unable to recover. On the NG, Stall Warning is driven by an AoA resolver input to the SMYD. Stall warning was triggered along with MCAS. The misleading AoA vane angle was presented to both functions (stall warning, MCAS). What changed from the 737NG in this area? The F/O did not trim aggressively to counter MCAS, and after two cycles it got away from him. Thanks once again, Peter. I understand the 737 has a system to increase stick force as speed increases separate from the trim adjustment (STS). On the Harrier we had the same and called it "Qfeel". With an AoA input this system could presumably have provided the stick force increase required by the FARs as AoA increased. Instead Boeing chose MCAS whose effect is to pitch the aircraft down away from the stall. My cynical engineering background is asking why they chose this rather brutal approach to a relatively straightforward certification issue if they met the stall characteristics requirements. Maybe I'm being too cynical. The issue is related to unwanted pitch up. While control forces can offer artificial feel, if nothing else happens, you have to push the stick forward and counter with elevator motion. MCAS takes that action with a stabilizer trim command. I think you are feeding my cynical side! Having experienced 2 trim runaways in the KC-135 (B-707), I can attest that an out of trim condition makes the aircraft very difficult to fly. Restoring “neutral” trim is essential for recovery, but the elevator applied forces makes it difficult or maybe impossible, especially in the low/negative alpha range, because the stabilizer jackscrew will bind or jam due to the applied forces. The most effective way is to get the aircraft pitch above the horizon so as to allow elevator “unload” and re-trim with the manual trim wheel. It isn’t absolutely necessary to get the nose above the horizon, but it would feel counter intuitive to release elevator back pressure to unload the jackscrew and be able to effect a recovery. This assumes that the electric trim has been cut out. Has the specific model of Rosemount's AOA been firmly established? They have a recently patented AOA sensor, which may be more robust. It looks like it has been available (patent applied date 2016) for a few years now?